First Aid Training comes to Shaw, Oldham! Helping you to help others! Did you know that we are the only Qualified First Aid Training company in Shaw? Jane Rawlings Training Consultancy was set up at the start of 2017 with over 20 years of learning and development experience. 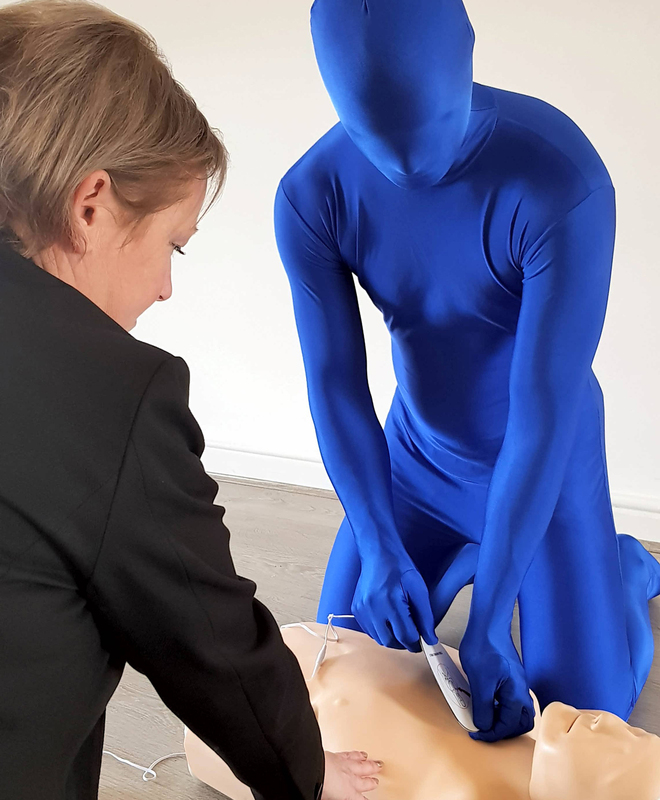 We even trained the running man – Sports Physio UK’s mascot last week on life saving techniques including using an AED. First aid training courses will include First Aid At Work, First Aid at Work requalification and emergency First Aid At Work. All training will include the use of AEDs. Courses will be held at the start of every week and will be held at Sports Physio UKs Shaw Clinic! Our First Aid training supports the British Resuscitation Council’s aim to save lives, prevent and reduce suffering and increase the well-being and resilience of people in the UK. Learning first aid can help you feel more prepared and able to cope in an emergency situation. For businesses, it can also help manage risks and reduce time lost due to illness or injury. Our regulating body is F.A.I.B – First Aid Industry Body. You never know when you might need to help a colleague, friend, family member, or even someone you don’t know; we think everyone should have the skills and confidence to act in an emergency. We offer scheduled first aid and health and safety courses and we can offer bespoke courses. Check us out !!! !